The Silver Queen is now beginning to appear in northern California landscapes. A newly described palm native to Brazil and is closely related to Syagrus romanzoffiana. This is a palm that has been growing in southern California, Arizona and Florida for a few years now and is looking like a contender for the cooler northern California climate. 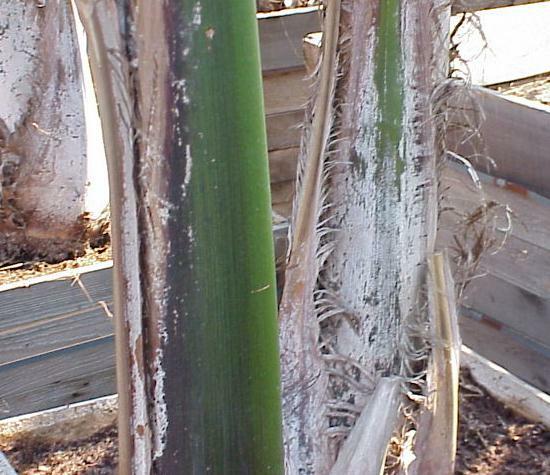 It is referred to as the Silver Queen although like any other new introduction, there are a few other common references that are associated with this palm such as "Coastal Queen Palm", Black Queen and Brazilian Robust. The most frequently heard common name is Silver Queen. The botanical name is not yet defined while some are calling this tree Syagrus romanzoffiana var. litoralis and some refer to it as Syagrus litoralis. The name Silver Queen comes from the heavy tomentum and bicolor leaf characteristic. The undersides of the leaf on mature specimens have a whitish cast to them producing a silver appearance when the sun shines on them. This is a more robust queen palm with a thicker trunk and dense compact canopy. With cold tolerance reports of down to 15 degrees F, and is likely due to the thicker trunk, although some reports are that there has been little sign of freeze burn damage at this temperature. This seems to be a better choice for cold spot micro-climates than the standard Syagrus romanzoffiana. While other varieties of queen palm are known to grow to 60 feet tall, the Silver Queen is only known to grow to 40 feet tall. The other most outstanding characteristic that identifies this species is the rich gradiant purple to green (and almost black in older specimens) color in the petioles of adult trees which radiates from where the petiole is attached to the trunk. There will likely be some variables in specimens as there are with many other species and natural hybridization will also most likely occur where Syagrus is available. Silver Queen is unusual with its purple petioles. Also noted is a heavier than usual tomentum that forms around the fibrous newly formed leaf bases. This particular palm likes a slightly acid soil when planting. These require monthly feeding during the warm growing season. The Silver Queen will certainly extend the "tropical look" throughout USDA Hardiness Zones 9 A and B, where other Queen Palms often succumb to cold temperatures.